The Spectacled Cobra (Naja naja) also known as the Indian Cobra is a species of the genus Naja broadly found across India. It is a member of the “big four” (venomous snakes commonly found in India).This species in amongst the four snakes in India that inflict the most snakebites on humans in India. The color (morph) and pattern of a Spectacled Cobra greatly depends on geographical regions The colouration of this species can be grey, yellow, tan, brown, reddish or black. Many specimens exhibit a hood mark with two circular patterns connected by a curved line, evoking the image of spectacles. This hood mark is located at the rear of the Spectacled Cobra’s hood. This species can easily be identified by its impressive hood, which it expands when threatened. If further disturbed, it hisses and strikes aggressively. 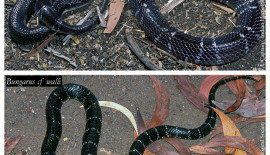 An adult specimen ranges from 1 to 1.5 metres (3.3 to 4.9 ft) in length. This species inhabits a wide range of habitats throughout its geographical range in India. It can be found in dense forests, open plains, agricultural belts, rocky terrain and wetlands. The Spectacled Cobra is a good swimmer and active both in daytime and night. Prey base include rodents, toads, frogs, birds and snakes. The Spectacled cobra is oviparous and lays their eggs between the months of April and July. The female cobra lays between 10 to 30 eggs in abandoned rat holes or termite mounds. The female stays with the eggs until they hatch in about 60 days.. The hatchlings measure between 20 and 30 centimetres (7.9 and 11.8 in) in length. They are independent from birth and have fully functional venom glands. 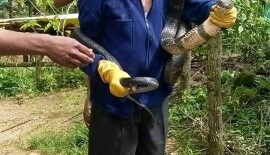 Snakes that can be mistaken to the Cobra are Rat Snake (Ptyas mucosus), the Banded Racer (Argyrogena fasciolata) and the Indian smooth snake (Coronella brachyuran). 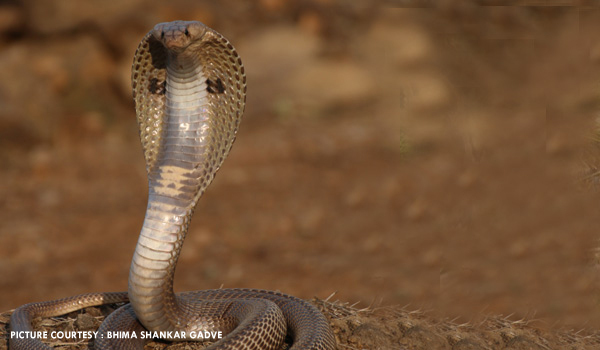 Common local names for the Spectacled Cobra are: Nag (नाग) (Hindi, Oriya, Marathi, Urdu); Moorkan (Malayalam);NaguPamu (Telugu), NagaraHavu(Kannada), Naga Pambu or Nallapambu (நாகப்பாம்பு/நல்லபாம்பு) (Tamil) “Phetigom” (Assamese) and Gokhra (গোখরো) (Bengali). Field Guide Book :Snakes of India by Romulus Whitaker and Ashok Captain.